What Types of Kitchen Cabinets are Available? Once the drywall crew had completed their work, the cabinets for the kitchen and bathrooms arrived. They are staged in the dining room and one of the upstairs bedrooms for easy access by the installation crew. Our cabinets were an upgrade option we chose at the Ryland Design Center. We went with larger 42'� tall cabinets made of maple and stained to match the flooring through the house. Once installed, granite will be placed on top of them in the kitchen and marble in the bathrooms. Cabinets are one of the most attractive features of your home and are often an important item that will influence the decision making process of any potential buyer if you decide to sell your home. In addition to the monetary value they add, they are essential to the usability and functionality of the kitchen and should be sized according to your storage needs. The kitchen is considered the heart of a home; emerging from the fact that this is the area of the home in which the family's meals are prepared. Renovating the kitchen would not only change or improve its aesthetic and practical properties, but would also help in raising the overall value of a home just in case the owner decides to resell his property. One of the most vital elements which are an essential consideration when it comes to renovating kitchens is changing the kitchen cabinets. Usually, kitchen cabinets contribute to the overall design of the kitchen the same way it contributes to the ambience produced in other rooms of the home depending on the hues and tones chosen. By just simply updating the look, one can also provide a friendly atmosphere and make the kitchen more functional by providing better storage space. There are different options to consider before renovating your kitchen. Before you begin your renovation, let's start with an overview of the different types of kitchen cabinets that are available. Basic cabinets usually come in two of the most basic styles, namely (1) the face frame type; and (2) the frameless type. That which is called the face frame type of kitchen cabinet carries with it a conventional look and is characterized by a wooden frame fixed on the outside of the cabinet's body. The frameless type is built without the face frame's wooden frame, giving the cabinet a modern and updated look. 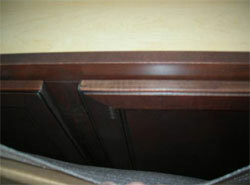 Cabinets are also classified according to how their doors look like. Cabinet doors usually are solid or have designed glass inserted between its panels. The inserted glass panels are produced to have various styles such as clear, stained, or frosted glass designs. Stainless steel cabinets are known for their durability and they can really be easy to install by just simply screwing them securely into a wall. One thing good about this type of cabinet is that unlike wooden ones, stainless steel cabinets do not need to be painted or refaced. Something to keep in mind however is that stainless steel will show more stains and handprints and will need to be cleaned often. If you are the type of homeowner who wants your furniture to be added with your own ideas of designs, details, and finishing touches, then custom kitchen cabinets may just be your thing. They cost quite a bit more than pre-made cabinets, but they would definitely add value to your home. Stock cabinets are separately purchased and are considered to be more economical. One very nice fact about stock cabinets is that they can look custom-made by just mixing, matching, and arranging different styles and colors. In choosing the best type of cabinet for your home, make sure to know first what you want your renovated kitchen to look like when it is done. It is either that you want your kitchen to appear brighter or you want it a bit darker in color; and you may even opt to choose a theme like country, ethnic, French, and many more. If you plan on hiring an interior designer, explain to the designer the overall look you desire and he or she will give you back a list of items which would be perfect for your renovating needs. Choosing the type of cabinets to use is not too tricky. One should also know in which establishment to buy their furniture and that the establishment should be a reputable one. This ensures a person that the money he paid is in good hands and that his purchased item is of high quality.